Bruce and Veda Rogers in full costume for the 1984 production of Hello Dolly at the Vassar Playhouse. 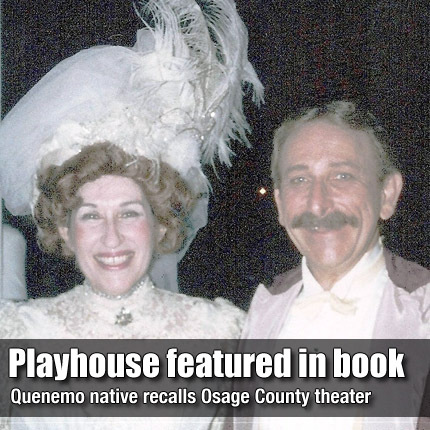 QUENEMO—A recently published memoir of a Quenemo native takes readers behind the scenes from the day a neglected old barn was envisioned as the Vassar Playhouse theater, until the day financial pressures forced its owners to close its doors. Quenemo native Veda Rogers, 77, published the memoir, Life’s About A Dream, in May. The memoir includes highlights of the life of Veda and Bruce Rogers, childhood sweethearts born and reared in Quenemo, from their connection to entertainment icon Ginger Rogers to successful productions and projects at the Playhouse. The Rogerses, both former music educators, opened the Vassar Playhouse in 1970, where they and their troupe performed plays, comedies, melodramas and musicals for audiences from all areas of northeast Kansas. Over the years, they expanded the business, adding a dining component to the entertainment experience and extending the Playhouse’s season from summers only to year-round. Although Ginger Rogers has little more than a cameo appearance in the book, the relationship between her and the Rogers family was a pleasant one.